This entry was posted on September 30, 2010 at 8:59 pm and is filed under Curiosity, Engineering, MSL, NASA. You can subscribe via RSS 2.0 feed to this post's comments. Both comments and pings are currently closed. It would be interesting to hear more about the failure modes on landing as this seems to be the biggest “new” thing that NASA is doing for MSL. 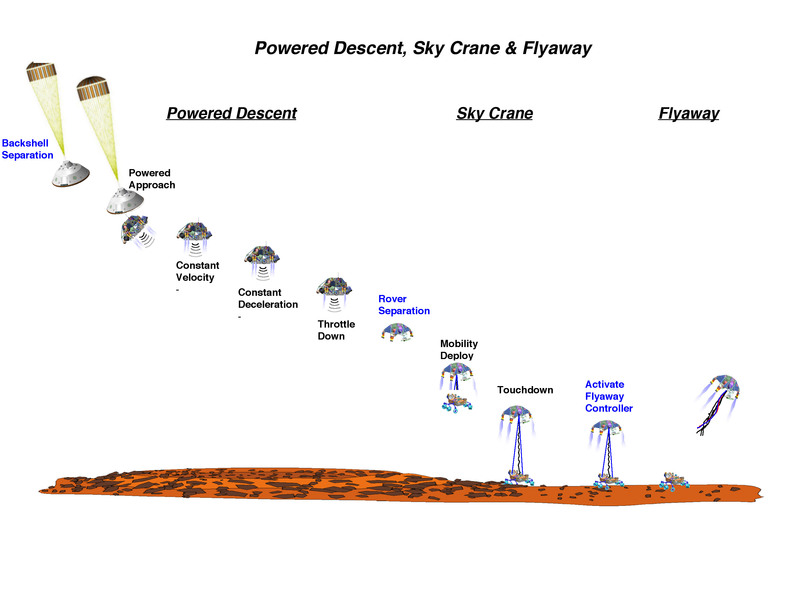 Rovers have been used and “proven”, but this Sky Crane just worries the hell out of me – seems like you have too many non-redundant points of failure and a critical path that is crazy filled with risk. What sort of redundancy do they have in that? What if the reels don’t let down evenly enough? What if the altitude is off? 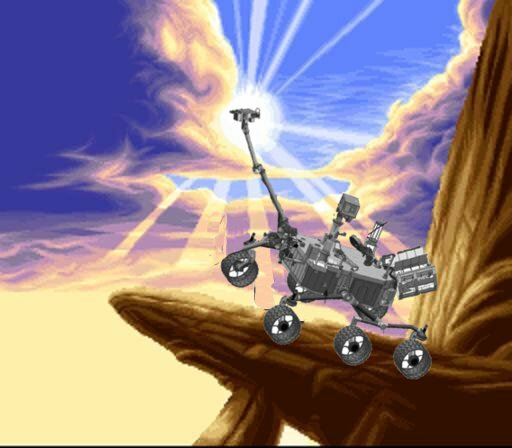 They had problems with their atmospheric readings before, ala Spirit’s landing – how’ve they managed that risk with MSL? I’m not expecting you to answer all those, BTW, just the stuff that rattles my head about this whole deal. I know they had to come up with something other than the airbags but it seems like the tried and true retrojets lander would be the safest option. This thing just gives me the whillies. I liked the photoshop job of Curiosity atop the promentaory at dawn. Can you do another one with you riding it like a bronco? Did Matt mention whether they have published a discussion of the algorithm/code they used to count rocks? I’ve been debating whether to use Weitz et al.’s [2006 para. 8 – 9] software with Meridiani soil, but maybe Matt’s algorithm is easier to implement. He didn’t mention whether it was published. I noticed that his presentations are not available on the public site, which makes me suspect that it’s not published yet. He did point to the relevant chapter in Jim’s Cambridge book, so that may be a good place to start looking for references. Both MER landers were lowered on tethers which had to be cut at the right moment. In both cases, all worked fine. No, the MERs used an airbag system to bounce along the surface until they rolled to a stop. I think bjm was referring the the fact that the rover dropped on a bridle from the backshell, used retro rockets to bring the descent to a halt, and then separated from the bridle. Both operations seem like non-redundant points of risk. 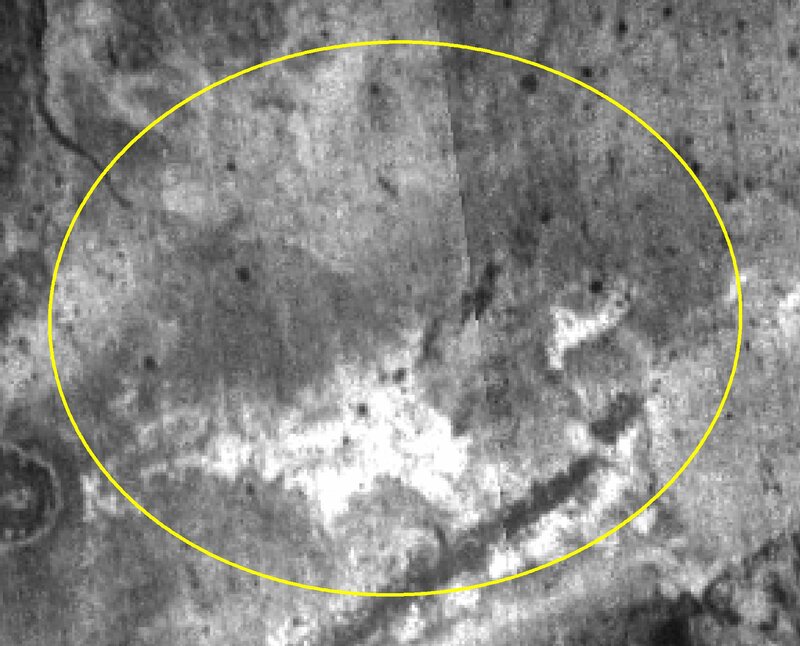 Obviously what MSL will do is different in many ways, but I think bjm’s point was that JPL’s success with the unreeling of the bridle and subsequent separation for MER should give us some comfort that it knows what it’s doing with the analogous (though different) operations for MSL. Er, I mean all three operations (the Spanish Inquisition strikes again!). Hi really enjoyed reading your article and was wondering Where do you get your information from for listing updates on your website? how often do you do such updates?